The historical perspective of Hindustani music and the music of the Persio-Arabian Region. Description and comparison of the melodic mode, Maqam and the Raga. Fusion and blending of the Magan and Raga, in the medieval period in India. Striking resemblance of Iqa with Tala, the metric units of the two music systems. 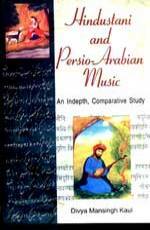 Existence of similar instruments, whether they borrowed from each during the course of evolution. The emotional element, Tasir and corresponding Rasa. The ornamentation techniques Tarkib, Tahrir and Gamak having identical elements. The folk music of the two regions sharing common sociological dimensions, revealing common practices and customs. Dr. Divya Mansingh Kaul, born and brought up in Uttar Pradesh, was initiated into Hindustani Classical Music at an early age, as she belongs to a family, who are great lovers and patrons of music. She studied Psychology, Journalism and then pursued a short career in banking. Since then she has been a homemaker, finding fulfilment in music. She has received her Alankar in Hindustani Vocal classical music from Akhil Bhartiya Gandharva Mahavidyalaya Mandal, and a Doctorate in Hindustani Vocal classical music from the university of Delhi. Her interest lies both in theory and the practical side of music. She is married, with two sons and this is her first book.